Sarah Wolhendler used to slave for hours over her weeknight dinner staple, a hearty beef stew — usually to mixed reviews from her three children, ages 6, 11, and 14. 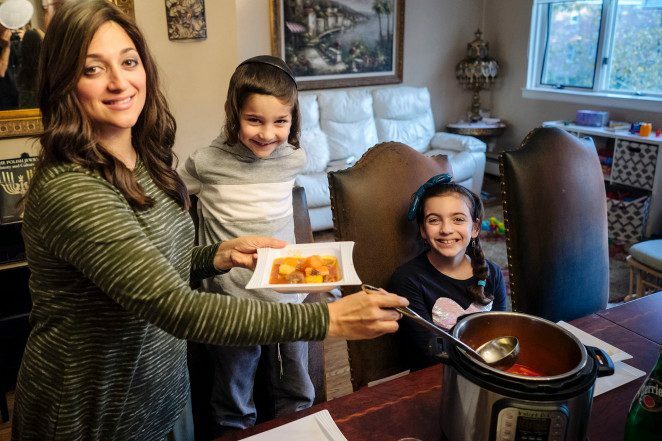 But last year, the Borough Park mother and full-time student found the secret ingredient to dinner success that now has her kids running to the dinner table like Pavlov’s dogs: the Instant Pot. Using the kitchen appliance — a multi-cooker that can function as a pressure cooker, a slow cooker, a rice maker or a yogurt maker — she can get dinner on the table in just 30 minutes and leave her tiny critics licking their plates. 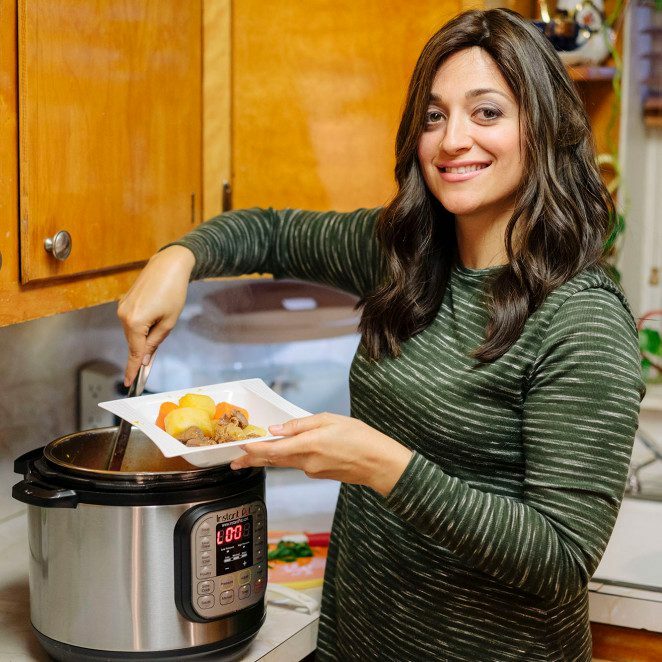 “I’ve never had them so excited for food, and I’ve never felt so confident about cooking,” says Wolhendler, 36, of the stew, which she prepares in the Instant Pot using the pressure-cooking function. The heat is on for the Instant Pot, with social-media buzz and the growing popularity of high-protein diets and healthy broths turning the appliance into a top seller. On Amazon Prime Day on July 11, the e-retailer sold more than 240,000 of the appliances, which retail for $70 to $160. There are hundreds of cookbooks devoted to the Instant Pot, and the company’s Facebook group has more than 700,000 users. Brick-and-mortar retailers say they’re having trouble keeping it in stock. “It sells out every week,” says Jacob Cortez, a manager at the Sur La Table kitchen store in Soho. “[It’s] one of the most popular items we are currently selling,” says Williams Sonoma VP of merchandising, Adam Blank. Double Insight, a Canadian company, released the first Instant Pot in 2009 and has since unveiled 12 models of various sizes and abilities, including one that can be turned on remotely via a Bluetooth device. While it boasts a variety of functions, it shines as an electronic pressure cooker, which heats and traps steam inside its chamber to quickly raise the internal temperature of food. While other companies manufacturer similar multicookers, the Instant Pot is the only one with a cultlike following. J. Kenji López-Alt, the author of the award-winning cookbook “The Food Lab,” agrees. “It’s to the point now where it’s almost like the word Xerox, where a lot of people refer to electric multicookers as Instant Pots,” he says. Food writer Melissa Clark says the pot is worth the hype. After making things like French onion soup and saffron risotto in the pot in less than 30 minutes, she couldn’t help but join the hoard of loyalists. “[It works] better than conventional cooking methods, and it does it faster,” says Clark, who just released a book devoted to the appliance, “Dinner in an Instant” (Clarkson Potter). But for all its time-saving prowess and tenderizing qualities, there are still things the device can’t match, such as the crispiness of a whole chicken roasted in the oven or the deep flavor of onions slowly caramelized on the stove-top, Clark says. And, while the appliance boasts a variety of functions, the clear winner is the pressure-cooker mode, and others can be lacking. “On any of the multicookers, the slow-cooker function does not work very well. You get zero reduction, and it tastes a little watery,” says López-Alt. But, he also notes that cooking food quickly at high pressure tends to yield tastier results than using a slow cooker of any sort. Devoted Crock-Pot fans should consider switching teams. At this point, López-Alt says “[Slow cookers] are good for keeping your beans warm at the family reunion” — and not much else. For those on restricted diets or looking to do the more healthy home cooking, the Instant Pot is especially appealing. 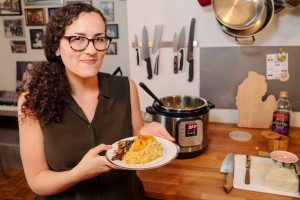 Laura Leebove, a food blogger and vegetarian who occasionally eats fish, says the gadget has drastically cut her time in the kitchen. Beets used to be a mess to boil and roast. Now, she can throw them in the pressure cooker, skin and all, and have perfectly soft beets on her plate in 20 minutes. “That was a game changer,” she says. Even pro chefs are turning into Instant Pot-heads. Carmine DiGiovanni, the head chef at Italian restaurant Aunt Jake’s, which has locations in Greenwich Village and Little Italy, says he was initially reluctant to believe the hype and typically shies away from “gizmos and gadgets” for cooking. But two months ago, a friend gifted him one for his home. Now, he’s hooked. But its most passionate fans are those who are less comfortable in the kitchen. 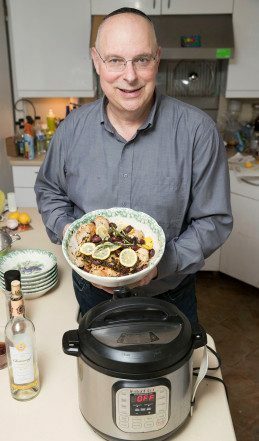 Joseph Abeles, a New Brunswick, NJ, physicist, got his Instant Pot in 2015, shortly after his wife moved out. The adjustment to bachelor life was a difficult one. His ex did most of the meals during their marriage and was an incredible cook, he says. But he learned to make things like brisket, steamed vegetables and, his favorite, a Manchurian beef that takes about 20 minutes in the pot’s pressure-cooker setting.